If you are planning on editing the content of pages for example inserting images/text/flash, the 'Body Text Editor' is where you can add that content. You will find the Body Text Editor when editing every Page/Product/Category and the Front Page. The following will detail how to edit the 'Front Page' using the 'Body Text Editor'. Add a link to the home page of your QOP Lite website. Place your curser in the body text field in the position that you wish to place a link. This field may already have text and images in place if your site has some content on the home page. 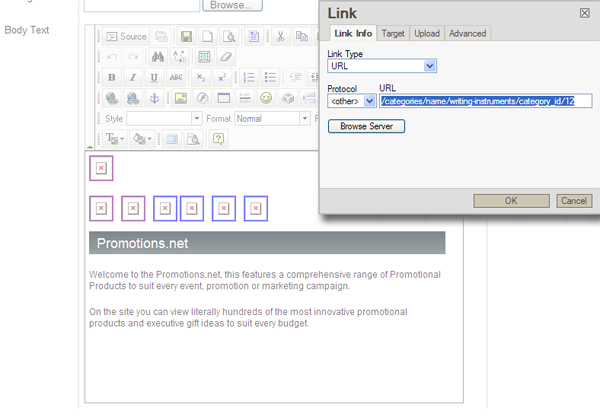 In the URL field you can enter the URL that you wish to link to. This can be a link to an external site or a location within the Lite website. Once enterred click OK and this will link the selection that you made in the body text area. Then click Save Changes and this link will become live on your website. Tables can often help if you are trying to align images and text up on the page. If you are not familiar with tables then the easiest way to think of it is an Excel spreadsheet with columns, rows and cells. Think about how you want your page to appear and split it up in to rows and columns. This will help you decide how to create the table. HINT: If you are finding that the table you add or the content is not going across the full width of the page, do the following; add one row at the very top of your table and insert an image that is 1 pixel high and the full width of the page. The width varies on the template you are using but is often 850 pixels wide. So create a blank image 850x1 pixels and insert this to the top row. This forces the table the full width of the page.